The Billy Bob Full Grill Gold includes one set of faux teeth with heat activated molding pellets. 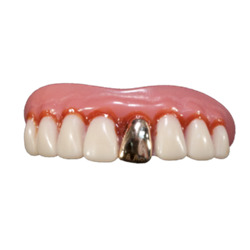 These swingin' teeth will look great with our Hustler costume! Add a pair of platform boots and an over-the-top Big Gold Chain, and you'll be ready to dance down to funky town!